This is the Life very much fits into a category of books which these days I am greatly enjoying and identifying with. Usually light in tone but with a serious and emotive core, these contemporary novels peel back the absurdities of modern life to reveal some truth about what it means to be human. The Humans by Matt Haig, is the most obvious recent example but Alex Woods and Lost and Found fit the bill too. I loved all these novels and This is the Life is a worthy companion for them all. Appreciation of the narrator’s wry cynicism is perhaps something that comes with age. As I enter my fifth decade and watch my children grow older, it may be easier to see what a crappy, absurd place the world can be. The novel follows two brothers, Louis and the nameless narrator. Louis is dying from a brain tumour and his brother is spending his last few weeks with him. Once close, the brothers have been separated for many years after Louis emigrated to Australia. The entire novel is set in Australia and much of its humour is derived from the differences in attitude between Brits and Aussies. The ubiquitous exhortation of ‘No worries’ takes on a different meaning when a loved one is terminally ill.
Louis’s decline is delicately handled. The timeline jumps back and forth, but the novel heads inexorably towards the final moments of Louis life. Shearer manages to evoke great emotion without ever becoming maudlin. Louis and his brother are like chalk and cheese. Louis has drifted through life doing as he felt right at the time; floating from one project to the next. His brother has always done what was expected; solid job, bricks and mortar. He’s remained sensible. Shearer poses an interesting question as to which brother has led the most fulfilled life. Does following your dreams necessarily make you a happier person? Much of the novel decries the futility of existence, why also asking why we spend so much energy wishing death would stay at bay: Everything dies or as Louis might put it, ‘We’re screwed’. If prayer cures people why does everybody die? What I loved most about the book (and here it most reminded me of The Humans) was the odd paragraph that in simple clear words dissected a truth of life. Shearer expresses views I hold in manner far more apposite than I could ever have managed. Whether it be about faith, fortune or family, Shearer’s narrator cuts to the bone. I have five or six paragraphs marked in my copy, and the book is worth the cover price for those alone. 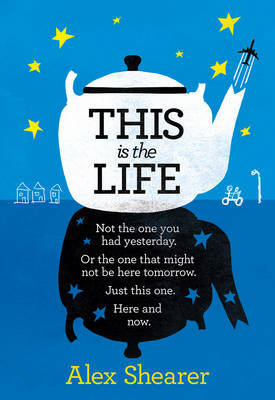 This is the Life is a melancholy book, how could it not be? But it is also curiously life-affirming. Louis is right, we are all screwed, but there is much good in between birth and death, not least of all the love of a sibling. Alex Shearer captures much of what makes life worth living, whilst accepting that much of it doesn’t make sense. Wry and happy-sad, this book is a keeper.